At the beginning of the year, if you would have told me that Braden would be participating in the USATF National Junior Olympic Cross Country Championships, I would have given you a strange look because he had only ran five total races prior to March! This race was his final one of the year and would prove to be the most challenging. My little running buddy has accomplished so much this year and when he was "discovered" by Coach Cezar Terlea of the Arkansas Performance Running Club Patriots it opened up a whole different opportunity to run track and cross country instead of the normal road races. Even though Braden qualified for Nationals in Jacksonville, Florida in the 1500 meter run, he wasn't able to go because of prior commitments, but looking into the future I knew he would most likely be able to qualify for Nationals in cross country at Albuquerque, New Mexico. As a reward for him doing so well this year I wanted to give Braden an opportunity to participate against the country's best runners, so I circled the date on the calendar and made hotel reservations far in advance. Braden has been putting out some fantastic PRs as of late and we hoped the momentum would carry him to a good finish in Nationals. He ran an 8:56 in qualifying for Nationals and based off of last year's championships the same time would have placed him in the top 100. An 8:37 finish would most likely have placed him in the top 50. Based off of those times, we figured a top 75 finish would definitely be doable. The race was on a Saturday, but I wanted to get to New Mexico a few days prior for a couple of reasons. The first was that it was a 12 hour drive and I wanted us to get time to recuperate from the journey and the second was I wanted him to get adjusted to the altitude (5,000 ft. above sea level). We left on Wednesday morning at 3 a.m. and planned on getting to Albuquerque by 2 p.m. I wanted to leave enough time for us to get in a run, so when we arrived at the hotel, we immediately changed and looked for a place to go. The weather was beautiful during our 2.5 mile run, but we could definitely tell that our breathing was more labored because of the altitude. I wasn't concerned about pace, I just wanted to stretch our legs after being in the car for so long. I considered the next day's practice to be more important since they would open up the course for the runners and I wanted to give him a more rigorous workout. Thursday was a very busy day! We started out the morning by going to Ninja Park where Braden got to train with a staff member for a couple of hours on the same type of obstacles that are on his favorite show - American Ninja Warrior. He has indicated, several times, that he wants to be an American Ninja Warrior when he grows up and he discovered that the training and obstacles he trained on were a lot more difficult than it looks on television. He had a wonderful experience and he would have spent even more time at Ninja Park, but we needed to get to the course for our training run. The course was at Balloon Fiesta Park, where they hold the annual balloon festival, and for his particular race, it was one giant loop around the park. For his age group (8 & Under), the course length is 2 kilometers (1.24 miles) and though the distance is not a problem, the more pressing issue is trying to run fast for the whole distance. Braden was still a little tired from the workout earlier in the morning, and with the wind and altitude, his training run was not good. He ran a 10:30 and he basically said that he didn't feel he would do good at all on race day. I told him that he would probably do better running with the other kids and he hopefully would be better adjusted to the altitude by Saturday. After our run we had dinner and then went to get his packet. The line for the packet was non-existent, but in the next room over it was a zoo. The room was where they had USATF gear and it was like being a kid in a candy store! I purchased Braden some long racing tights, a jacket and a shirt that he customized. On Friday morning we took our last run around the course and strategized what to do on certain parts and where I would be stationed at while he was running. Braden did better, as far as his time was concerned, but it still wasn't as fast he wanted it to be. Another thing that wasn't helping was him being congested and having a cough. He was fine on Wednesday, but on Thursday he started to have issues so we had to go to the store to load up on cough medicine and decongestant. After we left the course we went to the New Mexico Museum of Natural History where he took in all the dinosaur artifacts. He loved that New Mexico was a hotbed for Tyrannosaurus Rex and other big dinosaurs. Later, we went to the Albuquerque Convention Center where they held the opening ceremonies. Luckily, we arrived a little early because there were parents standing along the walls due to there not being enough seating for everyone. Braden marched in with his region and he got to listen to Olympic athletes and coaches address the runners as well as take the oath of sportsmanship. It really started hitting me that my little guy was a Junior Olympian and I felt so proud of him being able to reach this level. Saturday was the big day! I'll back up a little bit first to talk about the weather. The temperatures all week had been in the high 50s to the low 60s and even though it was a little windy, everything was nice. The forecast for Saturday, however, was not looking good. The prediction for most of the week was that the temperatures were really going to drop, it was going to be very windy, and there was a great chance for rain and possibly snow. Because of this, I packed for the possible cold weather and tried to mentally prepare Braden for the conditions. For the most part everyone likes to run in nice weather in training or during races, but the one thing we haven't had in any of our runs is bad conditions. When I woke up Saturday morning and looked at the forecast, I couldn't help but to feel optimistic about the race...mid-40s, 10 mph winds, and the possibility of rain later in the morning. I told Braden that it looked like Mother Nature was once again going to cooperate! Boy, was I wrong!!! After getting dressed we went out in front of the hotel and it actually felt pretty comfortable. At that point he didn't think he would need running gloves or a head band to protect his ears from the cold. However, a little later on when we were leaving to head out to Balloon Fiesta Park, it started to drizzle. Braden's race started at 9:30 and at 9:00 he was supposed to go to a big tent to report; this gave us about 45 minutes to warm-up. It was during the warm-up where the weather turned for the worse. The winds started gusting (which made it colder) and the rain started coming down. In hindsight, I should have just taken him to the car and have him sit until he was to report to the tent, but instead he was stretching and trying to get loose. There were a lot of teams from other states that had smaller tents set up that was at least keeping their athletes dry, but Braden was getting drenched from head to toe. By the time the 2K race for the girls started, Braden was shivering and wishing for the officials to open up the tent to report in. My final words to him was that I was extremely proud of him no matter how he would finish and that he needed to not as much worry about the time, but where he placed. Once Braden finally got in line to get under the tent, I had his mom wait to near his starting box while I positioned myself about 100 meters up the course from the starting line. When the gun went off, I tried to pick out Braden out of the mass of humanity that was composed of the 227 runners, but I didn't see him. As soon as they all passed me, I ran across the field to an area that had a hill so I could see him before the half-way point. Many runners went by before I eventually saw Braden coming towards me, I cheered him along and started to make my way towards the finish area. 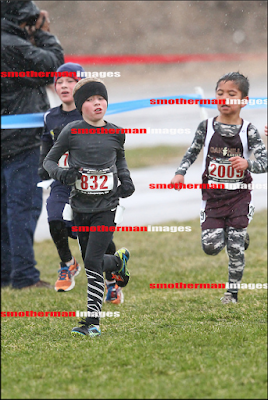 As I was running, along with hundreds of other coaches and parents, toward the finish area, I was having a difficult time running in the elements. All I could think about was if I was having a tough time running, how much more difficult it was for Braden. When I got to the finish area I saw the first place runner blitzing towards the end and then I had to wait. After a couple of minutes Braden finally came into view and I yelled for him to run like he's never run before and to kick it in. I didn't get to initially see where he ended up or his time, so I had to wait for the scoreboard to scroll through the names. His name finally popped up as the 148th finisher with a time of 9:49.6. His time was better than any of his training runs while in Albuquerque, but a minute slower than his qualifying time in Arkansas. I had to hunt him down and then we had to find mom and the poor kid was soaking and freezing and just wanted to go back to the hotel. I carried him back to the car and we headed off. 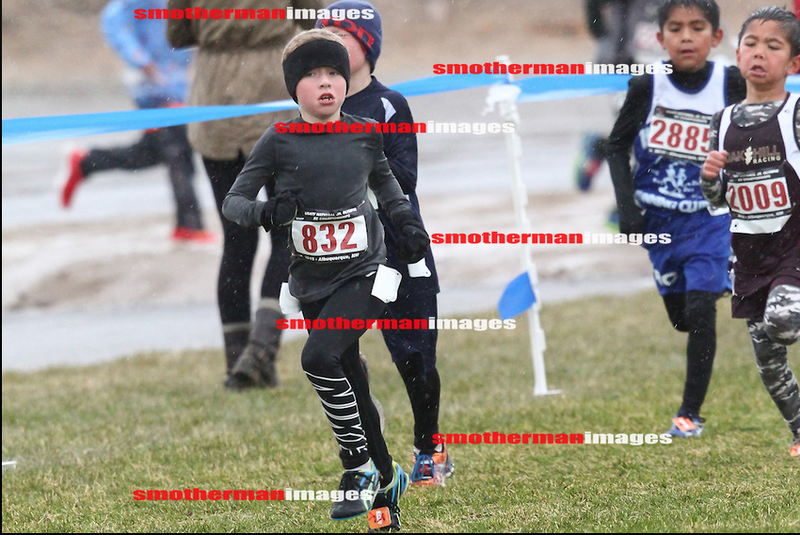 Braden was obviously disappointed in how his race turned out but I told him that I was still proud of him and that he ran in the worst conditions that he's had to race in before. I told him that there were a lot of kids that had advantages that he didn't. The first was the altitude...kids that lived in Colorado, Utah, etc. were used to thin air. The second was the cold and rainy weather...I talked with some parents from the north and northeast and they said they were used to weather like this back home. The third was him being cold and drenched before the race even started (especially after being congested and coughing for the past few days)...once again, my fault for not taking him to the car to keep him at least a little dry. Lastly, running on grass...this was only Braden's third race on grass because Arkansas doesn't have a lot of meets that involves cross country like those in the north and west coast who have a lot more experience running on the grassy terrain. Not trying to lay out a bunch of excuses, but they all factored into the performance. Once again Braden was disappointed, but he took everything in stride. The one big take away was speed. Braden is really good in the 5K-10K races and is pretty fast in those distances that require discipline in pacing. For the 2K cross country race and the 1500 meter run in track, pacing is a little different because for the most part you need to go all out. He's been doing a lot of 200 & 400 repeats, fartleks, etc. on the track to work on his speed, which has helped in his road races, but he needs to sustain higher speeds for the "shorter" distance races. When I talked with Braden's coach after the race, he said that this was a good lesson for him because, in Arkansas, Braden is a "shark" and doesn't have a whole lot of competition, but going up against the best in the country, it showed him what he needs to do to compete and improve. Braden recognized this and talked about needing to incorporate more track work into his training so he can be more competitive. It was great hearing him turn a negative into a positive and not get discouraged from the result...all it did was make him more determined than ever to better himself! After we got back to the hotel, Braden had some hot chocolate and got into the hot jacuzzi. The rain stopped shortly after his race, the winds died down and the sun came out...near perfect conditions for the other runners and their races. In the evening, we had some snow showers and when we woke up in the morning, there was snow everywhere. It was Albuquerque's first snow of the winter and we couldn't pass up the opportunity to play in and have a snowball fight. In the afternoon we were going to take a tram in the Sandia Mountains, but it was too windy, so we went to the Explora Science Center and Children's Museum where he thoroughly enjoyed himself. Sunday morning came early and with it the long journey back home. Braden said he had an awesome time, other than the race itself, and altogether it was a nice getaway before the holidays. My Junior Olympian is already looking forward to next year's race and the experience from this race will help him greatly. I told Braden not only will he be a year older in his age group, but the race will be in Hoover, Alabama, where it would be more like Arkansas in weather and altitude. Needless to say, he was very happy to hear about the change in venue. I suspect in 2016, after another year of training under his belt, he'll have a lot better result that will be reflective in the standings.